What comes to your mind when you hear the word "playground"? Me, I imagine a fun place where kids can play to their heart’s content. A place not unlike the ones found in our app of the day Pango Playground. As suggested by its name, Pango Playground allows kids to play in their own virtual playgrounds. The app comes with four scenes filled with a number of colorful wooden blocks and animal-shaped pieces that look unassuming at first, but at your touch they come to life with fun animations. To start playing, you select a numbered flag on the Home screen. Each scene has its own unique theme, so you are sure to find something to surprise you no matter which one you pick. For example, in Scene #1 you can tap on the blocks to reveal various playground equipments like a merry-go-round, seesaw, swingset, slide, and a hopscotch court. There is also a short but working train track as well as a cute convertible car that will make a honking sound when you tap on it. In Scene #2 you can tap on piles of sand to dig out gold coins, bounce a beach ball around the screen, and make coconut trees sprout out of wooden blocks. You can also tap on the alphabet blocks to see a different set of letters each time. 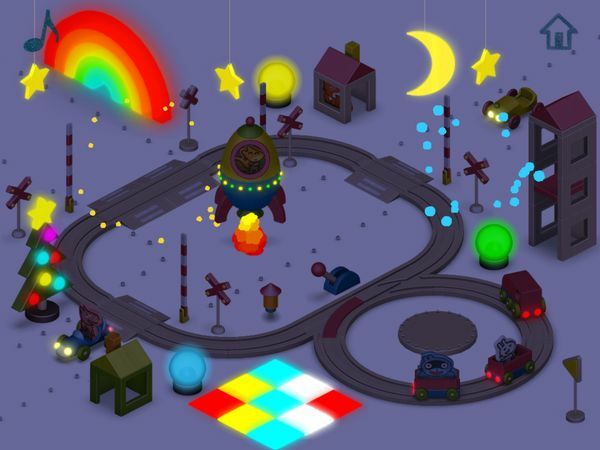 Scene #3 lets you can launch fireworks into the sky, navigate a rocket around the screen, and light up a Christmas tree. This scene is unique because it is also the only one that has a Night mode, which is toggled by tapping on the wooden sun hanging in the sky. 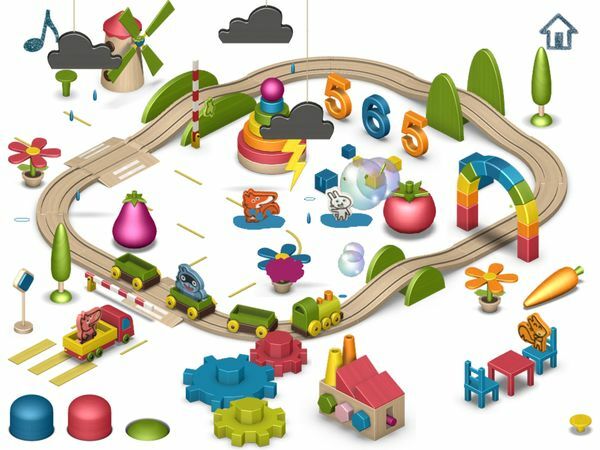 In Scene #4 you can grow fruits and potted flowers, run a bubble factory, power a windmill, and make it rain by tapping on the clouds in the sky. As the raindrops fall onto the fruits on the ground, they will grow bigger. Finally, each scene also includes a number of animal characters: a pig, a bunny, a raccoon, a fox, and a squirrel. It is interesting to note that these little animals can interact with their surroundings when you drag and drop them around the screen. You can make them ride the train, play hopscotch at the playground, sunbathe at the beach, and fall asleep when the night comes. Pango Playground is an interesting app that will suit young kids under five years old. Because it is quite simple to operate, it makes a great introductory app for little ones who are only starting to use the iPad. As a toy, the app offers simple, endless plays. There are no rules, time limits, or a scoring system. The app also doesn’t require any reading skills. One thing that parents should note is that the app contains links to the developers’ other apps in the Home screen. These links are protected by a security system which requires the player to answer a multiple-choice math equation before proceeding. To be honest, Pango Playground is a game that you have to try to love. At first glance it may look plain, but believe me when I tell you that there is more to it underneath. I love how there are plenty of things to tap and interact with in each scene. Many of the blocks even have several layers of interactivity, such as the lighthouse in Scene #2 which you can tap multiple times to see it spring into its full height. I also think the little animal characters are adorable despite not being able to talk. I really like dragging them around the scene just to see what they will do at certain places, and at one point I was surprised to see them splashing in water puddles in Scene #4! Finally, I also enjoy how each scene has its own unique theme. My favorite scene is #3 with its night mode, fireworks, and twinkling Christmas lights, but overall they are all really fun to play with. Despite its simplicty, Pango Playground is a delightful and imaginative playground that will captivate little minds everywhere. The app has plenty of interactive bits and pieces to explore, and some elements even offer new surprises after the first tap. Overall, it is very nicely executed, and I would highly recommend it to parents with young juniors. Wombi Toys. Repair and sort broken toys in your very own toy factory. Wee Subs. Build and launch your mini submarines into the deep blue.